FISHING TRIPS PERFECT FOR ADULTS, FAMILIES, & KIDS TOO! 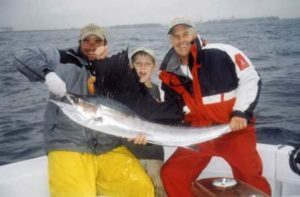 All-Inclusive Sportfishing provides a complete fishing/enjoyment package for the angler who demands impeccable service. We are full time professional licensed captains, with many, many years experience in the Ft. Lauderdale charter fishing industry. All you need to do is to show up. We take care of the details and make every effort to assure a pleasurable Ft. Lauderdale fishing experience. At All-Inclusive Sportfishing, aboard the 46′ Marlin My Darlin, we offer you a crew that brings a combined total of 70+ years of LOCAL experience of fishing in Ft. Lauderdale. 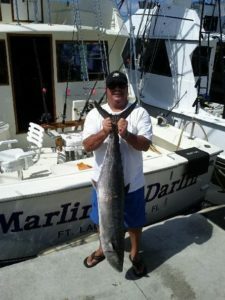 We have the necessary fishing knowledge to put you on the fish on a Fort Lauderdale fishing charter. Smaller fish for your smaller kids? We do it all the time. We all have our own kids so we know the importance of making them smile. Fish for the table? We know and fish virtually every offshore structure, reef and shipwreck for miles in either direction from our inlet and set that day’s approach accordingly. Looking for that big fish experience? We have guided countless numbers of anglers to literally hundreds of memorable catches over the years. Local experience is a huge factor not only in finding fish on a charter, but also gives insight as to what species of fish are more likely to be in our area and a good target species on a given day with the existing weather and sea conditions. Relaxed and enjoyable atmosphere, professionalism, and the team that sets the bar for offshore fishing in Ft. Lauderdale. A native Floridian, Capt. Rick Brady attended Fort Lauderdale High School, Broward Community College and Florida Atlantic University. Capt. Rick has been sportfishing in Fort Lauderdale and nearby regions professionally for over 45 years and bought his first Fort Lauderdale fishing charter boat over 25 years ago. He is the current president of the Bahia Mar Captain’s Association, the premier charter fleet for Fort Lauderdale fishing. He is an established and highly respected Captain in the South Florida Sportfishing community and is recognized for his Fort Lauderdale charter fishing accomplishments, as well as numerous tournament wins in South Florida and the Caribbean. Among these wins, he currently holds two Bahamas Billfish Championships, a true tribute to his dedication to fishing. When you meet Captain Rick, he’ll greet you with a smile. After all, how can you not be happy when you fish every day and you love what you do. Once the hunt begins for fish, you’ll see that in his eye – and his eyes don’t miss a thing! 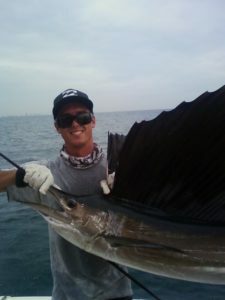 Captain Matt Fann is also a Fort Lauderdale native and a second generation captain aboard the Marlin My Darlin. Following in his own father’s footsteps, he is enjoying the opportunity to share in the rewards his career offers with fellow captains and also friendships made with anglers over the years. Smooth and easy days with good catches and good conversations when Captain Matt is aboard whether upstairs at the helm or running the cockpit. 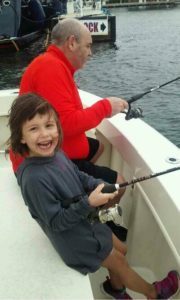 Three and five year olds at home give him the experience and demeanor to get the little anglers involved if you have kids and he is ready with the pipsqueak rods and reels the Marlin My Darlin carries aboard for the little ones. Action for everyone is a priority, but the big lumber for chasing a big Shark, Sailfish or Marlin is always nearby. 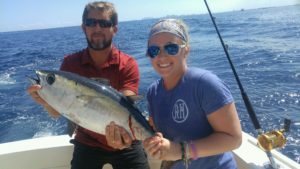 Captain Tommy Kopper brings a wealth of knowledge to the table as he also is a Fort Lauderdale native with years of deep sea fishing experience. Along with Rick and Matt he is experienced at every type of approach to offshore angling. From Snappers to Swordfish he approaches each day with the dedication to achieving a productive and pleasant day on the water. Captain Tommy always has an eye on the bottom and is very highly respected for this prowess there as well as his knowledge of the pelagics that occupy the upper levels of the water column. Ask Captain Tommy what he does on his days off and he’ll tell you he goes fishing! The full moon has been giving us a bit of trouble deep sea fishing in Ft Lauderdale this first week of September. While we really seem to be able to catch numerous Bonitos and Barracudas we are having particular difficulty with the Kingfish. The Kingfish we are catching are requiring a lot of patience and perseverance to get the job done. Kingfish as glamour fish? They can be, but not typically. An important fish for many a successful Ft Lauderdale fishing charters? You bet they are. 1st mate Andrew is putting a lot of effort into our program to get some Kings into the box .And he is getting it done. Not only Kings, but Jacks, African Pompanos, Tunas, Wahoo, Snappers and Sailfish as well/ you name it. It’s a long list. So let’s touch briefly on what sets one fisherman apart from the crowd so to speak, and this is from my “experiences” of 40 years of doing it. My favorite fish is the Blue Marlin and the “Marlin My Darlin” is named after this great fish. I watch him (Andrew) and his attention to detail and his dedication to perfection and marvel at his drive. Success is when preparation meets opportunity I like to say. My personal passion for fishing perfection allowed me to win two Bahamas Billfish Championships (each championship a five tournament series regarded by manyas the Superbowl of Sportfishing), place second twice and garner one third place against some very talented fishermen. Was I lucky? You bet I was, AND I surrounded myself with an “A” team crew involving some very special talented people. © 2017 All-Inclusive Sportfishing, Marlin My Darlin.